Middle Carboniferous, Lower Bashkirian: fig. 1, 3, 8, 9, 11; Lower Carboniferous: fig. 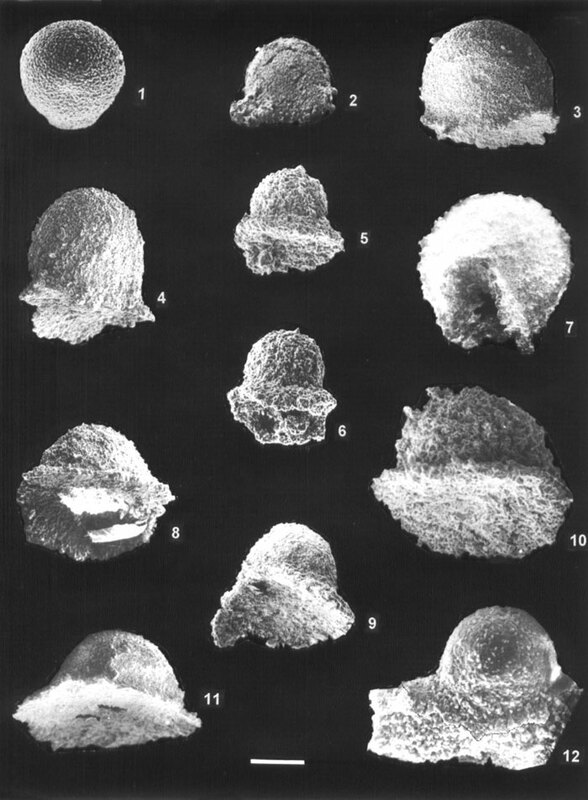 5 - Upper Visean; fig. 2, 4, 6, 7, 10, 12 - Serpukhovian. Fig. 1, 3, 5, 6, 8-11 - Kazakhstan, Pri-Caspian Dipression, North Dipression Side Zone, Karachaganak Massif: 1 - borehole12, sample 633 (depth 4656-4663 m), 3, 8, 9, 11 - borehole13, sample 3096 (depth 5109-5116.5 m), 5 - borehole29, sample 851827 (depth 5128-5135 m), 6, 10 - borehole19, sample 112 (depth 4760-4769 m); fig. 2, 4, 7, 12 - Uzbekistan, Tien Shan, the Ugam River, sample 803/24. Fig. 1-12. Caspiaza calva Afanasieva, (bar=100µm): 1 - FF-P229/205-00106; 2 - FF-P229/205-00312; 3 - FF-P229/205-00404; 4 - FF-P229/205-00406; 5 - FF-P229/205-00110; 6 - FF-P229/205-00122; 7 - holotype, FF-P229/205-00313; 8 - FF-P229/205-00412; 9 - FF-P229/205-00403; 10 - FF-P229/205-00103; 11 - FF-P229/205-00315; 12 - FF-P229/205-03206, sedentary form.